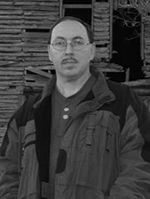 Ronald Kelly is an American horror author from Tennessee. Kelly earned his stripes in some of the most celebrated small press magazines of the horror hey-day, including Grue, Noctulpa, Deathrealm, Thin Ice, 2AM, Eldtrich Tales, New Blood, and was one of the earliest contributing authors to Cemetery Dance magazine at its birth in 1988. The following year, he sold his first novel Hindsight to Zebra Books. He enjoyed success as a horror author through the mid-1990s, his short fiction appearing in many major anthologies, with seven more novels released through Zebra/Pinnacle, before the company all but shut down its horror line in the late 1990s. He took a hiatus from writing for a number of years, but returned to the genre with his special brand of Southern horror with the release of a short story collection, Midnight Grinding, and a new novel, Hell Hollow, published by Cemetery Dance Publications in 2009 and 2010.